I wondered about the state of this church after reading about it, but was pleasantly surprised to find the brickwork in better condition than I thought although the classic purity of the architecture is ruined by the bricking up of the original, huge doorways and the insertion of rectangular doors in the wing in the early Nineteenth Century. The building immediately gives the impression of immensity in both width and height. It is in the shape of an equal armed cross (a Greek cross) with dimensions of 61' 10" for the each total side with the arms being 20' 10" wide and 16' in length from the center. 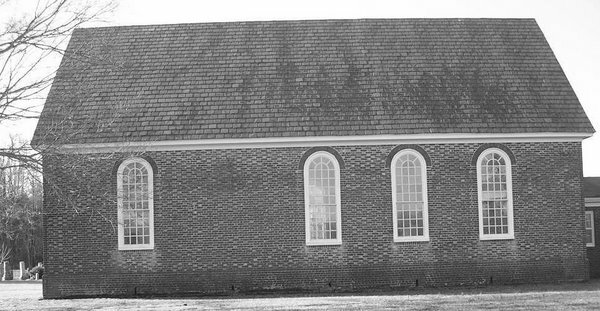 Like Aquia Church and several Northern Virginia ones (Pohick, Christ Church Alexandria, Falls Church), St Paul's has two stories of windows: the lower being rectangular with segmental arches, the upper typical compass windows. The walls seem quite high, some 25 feet at least so the total effect is of an imposing edifice. 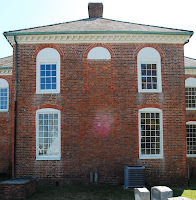 The brick is laid in English bond in the water table and Flemish bond above it. The transition from the water table to the walls is via a beveled brick. Rubbed brick is used at the corners and around the windows while the use of glazed brick is irregular and sparse. The walls are 21" thick. Major changes were undertaken in 1813 when the building was converted for two decades into a school. The original doorways were bricked up (they extended from ground level to well into the second story, reminding me of the the doors at Christ Church, Lancaster in size. These were located on the west, south, and north facades. Smaller, rectangular doors were then cut into the structure on the sides of the south wings and side. The windows were also altered significantly, some being bricked up and the top row with wooden frames for the compass window tops. I presume (perhaps incorrectly) that the window frames are not original. Compared to the massive changes to the doorways and windows, the repairs to the walls themselves seem minor and are catalogued in great detail in Rawlings (212 ff). We were unable to see the interior as no one was on site, but through the windows we could see that little colonial structure remains. The church was abandoned after the Revolution and when it was converted to a school, interior rooms and partitions were inserted. In 1830 the building was again converted to a church and the partitions removed, but the rooms on the northern wing were kept as offices. As a result the church was converted into a T-shaped room bearing little resemblance to other cruciform churches. Rawlings cites Aquia Church as the general twin to this building, so a look at its interior will give the viewer the impression of the original interior. The graves in the surrounding churchyard also contain many interesting monuments. All in all, this remains a pleasing edifice with much to be admired in the brickwork despite the drastic changes to doorways, windows, and interior. 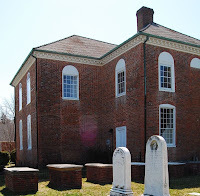 It stands on a small knoll not far from Route 301 where it crosses to Maryland, and we found the rolling country pleasant for a Mini Cooper mad drive. The nearby town at Dahlgren has several restaurants close by; we ate at one of the Chinese buffets which we found cheap, friendly, and satisfying.